It's just turned 8.00am and already more than 200 people are huddled before the gates of a small depot in 6 October City, west of Cairo. Weary and visibly agitated, it's another day of waiting for ordinary Egyptians short on gas to prepare hot food and warm water. Soon, the crowd hopes, a truck bearing the much-needed butane canisters will finally arrive. As patience ebbs, tempers flare. Confronting the luckless employees at the depot is Ramadan, a 60 year old bawab (doorman), clad in a light grey long-flowing robe and wearing a white prayer cap. "Please, I've been waiting for 10 days to get my cylinder -- who can bear this?" he yells. Ramadan is getting used to long waits; he says buying a new butane cylinder now takes more than a week. Surrendering his empty canister to the depot, his national ID card is logged by staff and he is given a receipt. Around seven days later, he returns to pick up a full canister and pay LE5. It's a sizeable reduction on the real cost of cooking gas, according to Egypt's minister of supply and internal trade Gouda Abdel Khalek. He says a 12.6 kilogramme cylinder actually costs LE80 apiece -- 16 times the retail price at state-run depots. Egypt imports more than 50 per cent of its butane, mainly from Libya and Saudi Arabia. It is bottled locally then sold at subsidised cost to householders, hotels and restaurants. Since 1991, butane cylinders have been officially priced at LE2.75, with transportation to depots raising the cost to LE5. The gas is subsidised by an annual LE20 billion ($3.3 billion), around 20 per cent of total subsidies granted to fuel in Egypt, according to government data. With only a fraction of Egyptian households connected to the natural gas grid, the vast majority of citizens are dependent on refillable butane canisters for heating water and cooking. According to the statistics mentioned in parliament, around 4.5 million households have piped natural gas while some 12 million Egyptian homes use canisters. During winter, shortages become the norm. Usually in March, the supply line eases. This year it did not. "The butane crisis is becoming more tangled and we're not seeing any response from the government's side," said one customer in the jostling crowd who refrained from giving his name. All four butane gas depots in October City have the same problem, he said, even though he sees trucks arriving and delivering canisters every day. "How are the canisters disappearing?" he demanded. Inefficient distribution is the most common answer from Egyptian officials. Speaking before Egypt's parliament in early February, minister of petroleum Abdallah Ghorab said the country has enough gas to meet local consumption needs but it is being siphoned off on the supply side by profiteers and corrupt practices. Distribution of butane is divided evenly between state-owned companies and the private sector. The latter is responsible for reselling canisters on the black market, the vice-president of Egypt's General Authority of Petroleum said during a conference last month. Speaking in parliament in mid-February, MP Mostafa Bakri accused the government of not addressing the distribution problem and claimed figures related to the Mubarak regime are creating the crisis. Explanations like these seem to ring true for those queuing in October City. "I feel a great victory if I get a canister from the depot," Eslam El-Gohary, who lives near one distribution centre, told Ahram Online. "It's much easier to get one from a street vendor but they charge much more." A butane cylinder sold on the street typically fetches around LE50, ten times the official price. El-Gohary claims vendors are cutting deal with depot workers to get hold of gas canisters, reselling them at marked-up prices and splitting the profits. Such allegations are nothing new. In September 2011, Abdel-Khaleq announced plans for a new coupon system for distributing butane gas cylinders which would limit profiteering. The new system was supposed to be introduced to the governorates of the Red Sea and the New Valley, two of the least populated part of Egypt, before being rolled out in the rest of the country. Such a system would have involved 14 million ration cards, benefiting 65 million citizens, Abdel-Khaleq said at the time. It would have crashed the black market, he claimed. Yet this plan has still not been implemented. Egypt's first post-uprising butane crisis began in May last year, when those living in poorer areas of Cairo had increasing difficulties in securing cooking gas from depots. The street price of a canister soared to LE25. The stakes go beyond a few bouts of hunger. Disputes over cooking gas in Egypt have ended in fatalities in the past. "It's not about buying or exchanging a gas canister -- it's a war that can end with people injured or dead," was how Ayman, a tuk-tuk driver who delivers canisters from households to the depot, melodramatically described the situation. Over the last year, few of Egypt's governorates have escaped unrest related to a shortfall in cooking gas. 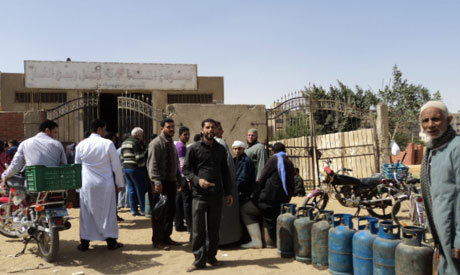 Earlier in March, dozens of residents of the oasis town of Fayoum, 130 kilometres southwest of Cairo, stormed government building to protest butane shortages, Ahram's Arabic-language portal reported. Around the same time, hundreds of protesters in the Upper Egypt regions of Assiut, Luxor and Aswan blocked railways to demand the government meet a range of demands -- prominent among them was price and supply control for cooking gas. Such protests, sit-ins and strikes have forced Egypt's police and army to provide armed guards for gas deliveries, Al-Ahram newspaper reported in December. The turmoil has impacted inflation figures too. Egypt's annual headline inflation rose a monthly 0.7 per cent in February 2012 to reach 122.1 points, fuelling a year-on-year climb of 10 per cent, Egypt's state statistics agency (CAPMAS) said last week. The agency's data showed inflation was being fuelled by broad climbs in consumer prices. These include hikes in natural gas and butane, up an annual 12.4 per cent.